This weeks Tuesdays With Dorie was a choose your own adventure of recipes. It was between Blueberry Muffins and Sweet Berry Fougasse. These recipes cane be found in Baking With Julia on pages 208 and 194, respectively. I decided on the Sweet Berry Fougasse because it was the simpliest recipe to make vegan. Granted I could have pulled of doing the Blueberry Muffins, but I already has some focaccia dough ready to go in the freezer. So, it was a very easy decision. Also, the only thing I changed in the recipe was the crumb topping. I substituted vegetable shortening for the butter. I know I could have just used vegan butter, but sometimes it leaves that not so nice soy taste in baked goods that I don’t really care for. 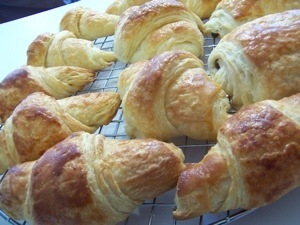 This weeks Tuesdays With Dorie recipe is CROISSANTS, which is being hosted by Amanda of Girl+Food=Love. This recipe is located on pages 185-186 in Baking With Julia, if you cruise on over to Amanda’s page it should also be there. I have actually made croissants before, so I knew a couple of tricks that I didn’t know the first time that helped me out here. Mainly, if the recipe says to refrigerate the laminated dough (butter already incorporated) while doing the turns, you might want to only do half of the the time because you run the risk of the butter getting too cold and cracking while you are rolling it out. Which doesn’t make a pretty croissant, but it does taste good. With this recipe it actually takes a couple of days to complete because you make the base of the dough, refrigerate it for 8 hours or overnight, add butter/laminate/do turns, rise for 3-4 hours, and finally form and bake. I think the hardest thing for me during the recipe was rolling the dough out. I was having a hell of a time, and getting a constant workout. But it probably doesn’t help that I had recently taken a 3 hour Glucose Test and my arms were bruised up (FYI I passed). The first half of the dough, I accidentally made really small croissants. I had them rising on the counter for 3-4 hours and they really didn’t rise too much, but I baked them anyways. They looked okay, but they weren’t nice and fluffy. I did this part while my daughter was taking a nap. She decided to take a really short one so I was unable to roll out the other half of the dough until she went to bed later that night. So at 10 pm I rolled out the rest of the dough. I made 2 chocolate croissants and the rest plain, and I actually made them bigger this time. I wasn’t about to stay up for 4 more hours because I am almost 30 weeks pregnant and chasing around a toddler all day is exhausting. So I decided to do an experiment. I left the dough on the counter overnight to let it rise. Ten hours later, at 8 am, I walked into the kitchen to bake them off. They had rose beautifully and looked great, and they baked up perfect. Now I just need to practice forming the croissants so that I get the more traditional look. 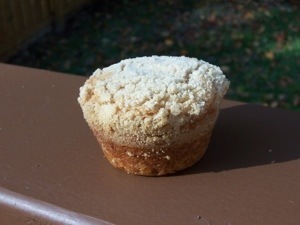 This weeks Tuesdays With Dorie is being represented by Alisa of Easier Than Pie with the recipe for Buttermilk Crumb Muffins, which is located on page 207 in Baking With Julia. I was reading a lot of peoples aversion to shortening aka Crisco this week on the P & Q. I thought it was pretty interesting since most traditional icing recipes like Wilton’s Buttercream recipe is pretty much all shortening. Personally for icing I find that recipe too sickly sweet so I always stick with an Italian Buttercream. But I just thought it was pretty funny that a lot of people were disgusted with the amount of shortening and either swapped it out with a healthy alternative (apple sauce) or just used butter. I understand the health alternative, but REALLY butter isn’t that much of a better alternative. Although, I was that person that ate these warm with butter, and they were yummy. This recipe was actually really straight forward and I ended up making 12 standard size muffins plus 2 large muffins aka Texas size. So ideally the recipe makes 16 standard size muffins. The only thing I changed about the recipe was to increase the cinnamon to 1 teaspoon because I love the flavor of cinnamon. With the weather getting cold and the leaves turning, cinnamon is one of those spices that I love having in baked goods. It reminds me of Fall and Christmas. I am not really a slacker. I actually made this on time last week and enjoyed it for dessert last Tuesday. But then, of course, life interferes with everything. The weekend before we were in D.C. visiting my brothers-in-law and their significant others. We brought the munchkin with us because they really haven’t seen her since probably Christmas and she has changed A LOT since then. My crazy little girl is cruising around the house, crawling on all fours, military crawling, climbing up the stairs, and getting into everything. Especially the dog’s water bowl, she loves to splash in that. She still laughs at me when I tell her no and she likes to laugh when I hurt myself. I guess I am pretty hilarious. She has finally cut two teeth, but I have been told by my mom that I didn’t get my teeth until I was almost one so it looks like my M&M takes after me since she is now 11 1/2 months. Emma provided plenty of entertainment for her Uncles and Aunts and actually behaved very well. When we got back from D.C. I jumped into gardening mode because it was going to rain soon and I needed to get the rest of the vegetables in the garden. For that I was rewarded with a tick bite, which confuses me because the only way that thing could have gotten on me is from the trees. So I blame the squirrels in a yard but then our house does back up to a forest aka very wooded area. Of course, I freaked out when I found it and could barely reach it to get it off me. Mike couldn’t hear me screaming because he was dealing with the baby. So I made him make sure I got all the tick out and the proceeded to play the time honored game of Is That a Freckle or a Tick. Jump to a week later, we are in Philly for a wedding and it is our first weekend away without Emma. I am getting dressed and notice that the area around my tick bite is red. Well that is just freaking great. I ask about the duration of the illness and he tells me that we caught it at the first stage so with antibiotics it will go away. So with that said and done here is a lovely picture of my Pecan Sticky Buns. They turned out a little darker than I anticipated but then I remembered that I used dark brown sugar 🙂 Mike said they tasted like his Mom’s Monkey Bread, which it really did. All of the steps for the recipe didn’t bother me because the end product was fantastic. Who wouldn’t love a sticky bun made out of brioche dough. I ended up freezing half of the brioche dough because there was no way we could have eaten 14 buns in this house. This weeks recipe was hosted by Lynn of Eat Drink Man Woman Dogs Cat and Nicole of Cookies on Friday. 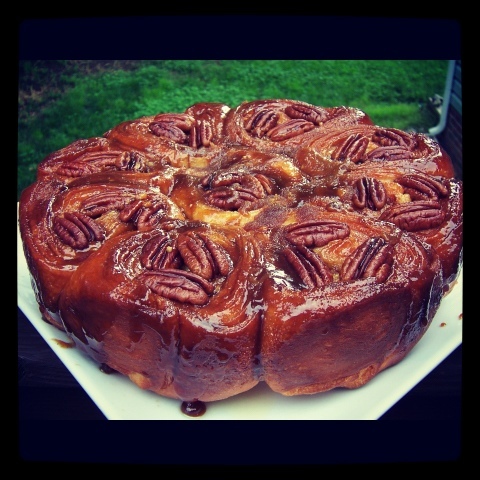 The recipe for the Pecan Sticky Buns can be found on page 190 in Baking with Julia. 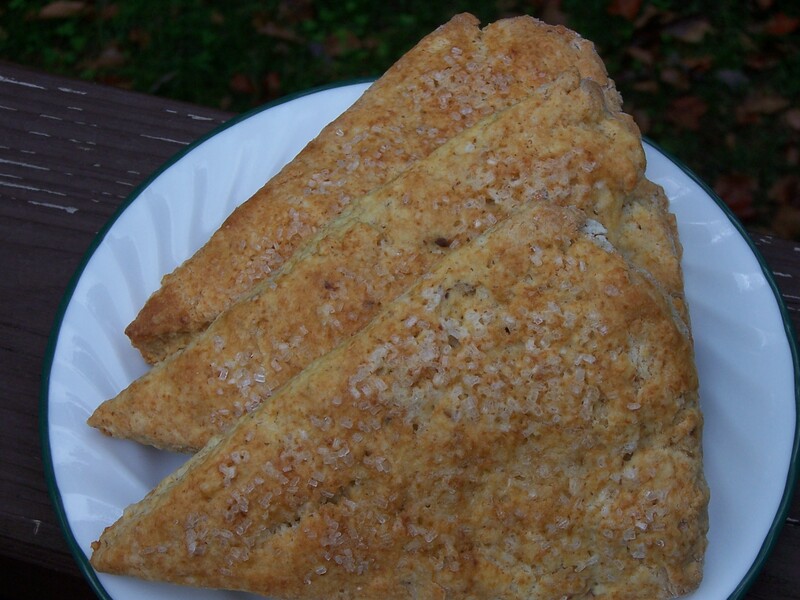 I guess in Australia and England these are called scones, but in North America we refer to them as biscuits. Scones, biscuits, I don’t care what you call them they are straight up yummy. This recipe was actually very easy to make and came together very quickly. 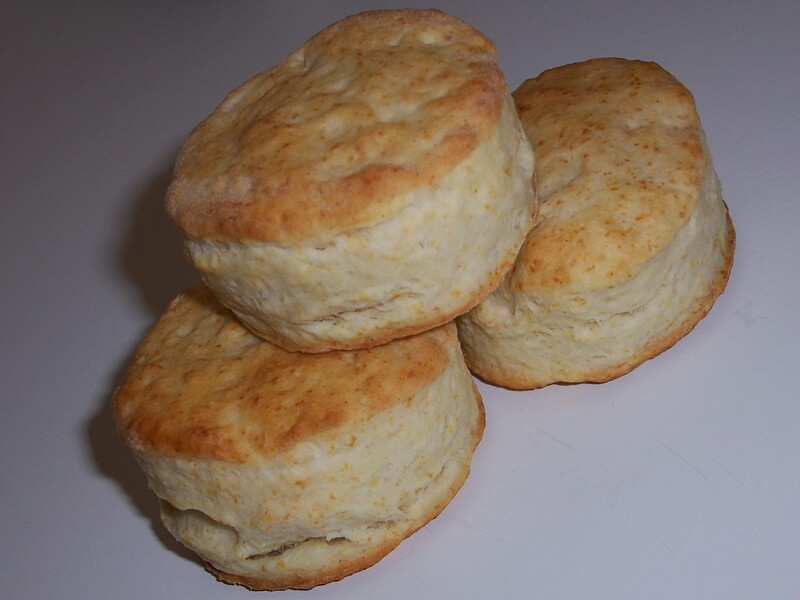 I have learned over the years that when you make biscuits/scones there are two important things to remember, 1) work quick because you don’t want the butter/lard/fat to melt because they make your biscuits flakey, and 2) if you want some layer action, it is like making puff pastry, fold the dough over on itself a few times during the kneading process. Both of these things have helped me make scones/biscuits that are nice and fluffy. These scones/biscuits turned out perfect. They had a nice fluffy texture, and rose to a perfect height. No crazy hard hockey puck biscuits here. I made up a batch and we had them with breakfast this morning. Without further ado, here is the recipe. I am being summoned by my little nugget, Emma, she isn’t happy that Mommy isn’t paying attention to her 🙂 Happy baking and eating. 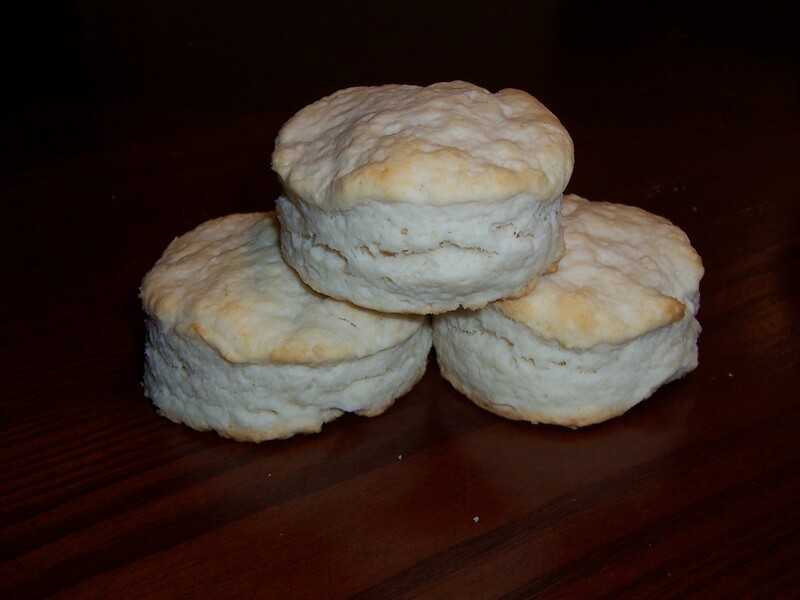 Recipe Source: The challenge scone (biscuit) recipe has been especially formulated by Audax Artifex after a large amount of research and experimentation. It is designed to help you master the techniques involved in making scones (biscuits) exactly the way you like them. 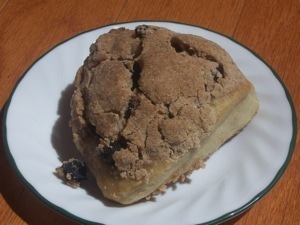 So the two recipes chosen for this week were Honey Nut Scones, which I changed to Maple Hazelnut Scones, chosen by Jeannette of Whimsical Cupcake; and Far Breton chosen by Nicole of Cookies on Friday. Both of these recipes can be found in Baking: From My Home to Yours on pages 31 and 202, respectively. I sat down this morning with some Irish Breakfast Tea and a Maple Nut Scone, and I was perfectly content with my choice. I couldn’t really taste the maple, but the hazelnut flavor was very nice and the tea balanced everything out. I had just enough time to eat my scone and drink half of my tea before Emma woke up and wanted feed. I have to say, that it was very good timing. The Far Breton, made my life so simple. Especially since I was trying to make it the night before. After I made the batter and placed it in the fridge, I decided that soaking the prunes and having them ready for today would make life easier. So I walked over to the pantry, checked my bag of dried fruit, only to discover that I was mistaken and didn’t have any prunes…I had dates, CRAP! I guess I will just have to drink the Earl Grey tea that I just made and wait until tomorrow since I really couldn’t/didn’t want to do anything about it on HALLOWEEN. 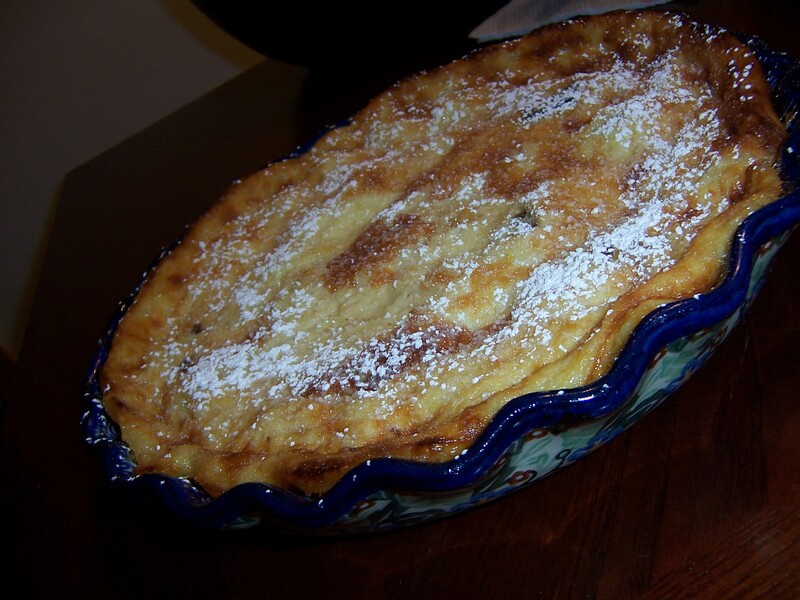 This weeks Tuesdays with Dorie was chosen by Jennifer of Cooking for Comfort. She picked Dorie’s Basic Biscuits which are located on page 21 in Baking: From My Home to Yours. 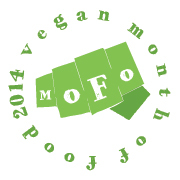 As I explained in last weeks post, this is Vegan Month of Food and all of my posts will be made Vegan. This week Tuesdays with Dorie was no exception. I perused some of my vegan cookbooks (Vegan Brunch and Vegan with a Vengence) to make sure that I made the biscuits as close to the recipe as possible. I have made vegan biscuits before (Pumpkin and Regular) and with most biscuit recipes you just have to replace the milk and the fat that you use for the biscuit and voila, yummy biscuit. That was the exact changes that I made for the recipe. Instead of 6 tbsp of unsalted butter, I used 4 tbsp Earth Balance Vegan Buttery Sticks and 2 tbsp vegetable shortening. Instead of 3/4 cup milk, I used my go to non-dairy milk which is rice milk. It has a much more milk flavor than soy, which works out well if you have someone that doesn’t like the flavor of soy.